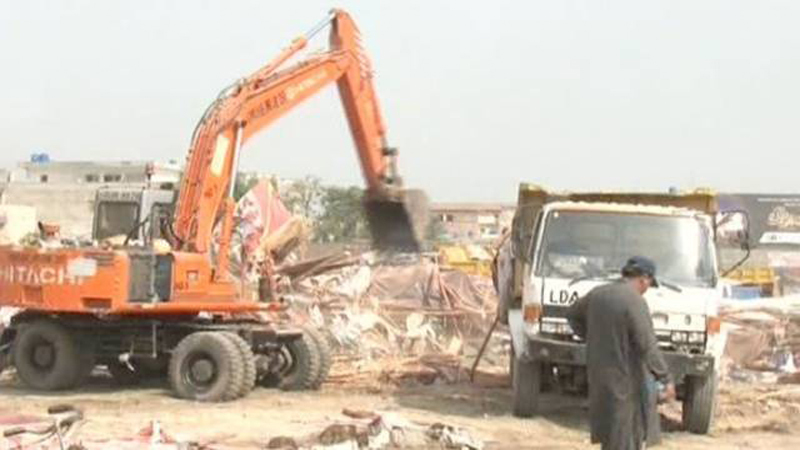 LAHORE: The Lahore District administration on Saturday halted an anti-encroachment drive against land mafia and illegal encroachments for an indefinite period. The operation was halted following the arrest of Pakistan Muslim League-Nawaz President Shehbaz Sharif by the National Accountability Bureau on Friday. The drive against land mafia and illegal encroachments in Lahore was launched a day after the Supreme Court ordered the Interior Ministry to place alleged land grabber Mansha Bomb and his sons on the Exit Control List. During the first two days of the operation, the Lahore Development Authority (LDA) demolished the furniture market of land grabber Mansha Bomb and retrieved over 25 showrooms and 20 commercial plots in the market located at the PIA Road. The authority had said that they had expected to retrieve 31,687 kanals of state land, 280 acres land of the forest department, eight plots in the Walled City, 636 kanals of land that belongs to LDA and 32 plots worth Rs 2 billion of the Metropolitan Corporation Lahore during the drive. Encroached land statistics by Commissioner Office and District Administration clash: Lahore Commissioner Dr Mujtaba Paracha claimed that as many as 1,368.8 kanal land worth Rs 7,761.1 million has been retrieved so far across the division. The land was retrieved during the continuing anti-encroachment operation of Punjab government against land grabbers and those people who had temporary encroached land by setting up stalls of food, jewellery, fruits and other items. He informed that the government has removed 3,567 temporary encroachments and 2,343 permanent ones from the first day of the operation until today. The enforcement teams have also lodged 28 First Information Reports in different police stations of Lahore, Nankana Sahib, Kasur and Sheikhupura. Teams have imposed Rs 400,000 fine on various shopkeepers by cleaning up the encroached area. According to details, the government gets back 135 kanal land in Lahore, 856 kanal land in Sheikhupura, 368.1 kanal land in Nankana Sahib and nine Kanal land in Kasur. The Lahore commissioner said that the operation would continued until the elimination of all encroachment and land grabbers as per the strategy which has been set for them. It is pertinent to mention that the statistics of Commissioner Office and District Administration is clashing. District Administration Lahore has claimed that they have retrieved more than 400 kanal land worth millions from Mansha Bomb and farmers of Anno Bhatti, who had cultivated potatoes, corn and other crops on the state land of the Forest Department. Punjab CM says land grabbers will not be spared: Punjab Chief Minister Sardar Usman Buzdar presided over a high level meeting at the CM Office to review progress on the operation launched against encroachments and the qabza mafia. The Punjab chief minister in the briefing was informed that 250 acres of state land has been retrieved from qabza mafia in four districts. The value of this land is more than Rs 7 billion. The chief minister expressed satisfaction on the operation against encroachments and qabza mafia, and said the retrieval of state land worth billions of rupees in a few days is the result of coordinated efforts of concerning departments. He congratulated the administration, police, authorities and concerning departments for this achievement because they have shown excellent performance. He said such performance should continue in the future to eliminate the qabza mafia. He said the operation against encroachments should continue and the common man should not be disturbed and that he is personally monitoring the operation. “The powerful encroachment mafia will not be spared. The operation should continue in full swing and proposals should be presented for the utilisation of the retrieved land,” he said. The CM added that these cells will be set up at DC office and officials of concerning departments should be its members. The CM directed the setting up of a Steering Committee under Punjab Housing Minister Mian Mehmoodur Rasheed to review all matters regarding the operation against encroachments and present recommendations in this regard. Board of Revenue senior members, concerning secretaries and administrative officers will be included in the committee. Addressing the meeting, Mian Mehmoodur Rasheed said the people should provide information to the anti-encroachment cell about the encroachment mafia so the operation could be successful. Published in Daily Times, September 7th 2018.